Blogtown: Miss Parton At The Dollywood Bowl! I've always wanted to see Dolly Parton live, and I finally got the chance last Sunday at the Hollywood (DOLLYwood!) Bowl. I took my friend Lacey as her birthday present, knowing how much she also loved Miss Parton, but not knowing how deeply we would both be affected by the wonderful angel on Earth that is Dolly. We got there with plenty of time to spare for once, but wondered why so many people were tailgating in the Bowl patio area. Like WAY way more than normal. Once we got the the line to get in, we realized why. This was a "leased event", meaning you don't get the normal Bowl perk of bringing in your own bottles. Ugh. So now the entire Bowl audience was slamming their fine wines, trying to not waste them and still be on time for the show. So, now even though we HAD been on time to the show, we were not in our seats until just after "Jolene". Sigh. Still all good ... we were seeing Dolly Parton live! When we walked in, Parton was telling a story about having put her Mother on a pedestal (and believe me, her stories are as good as her songs) - as that was just about the only place that would keep her Dad away from her (there were 12 kids, after all)! 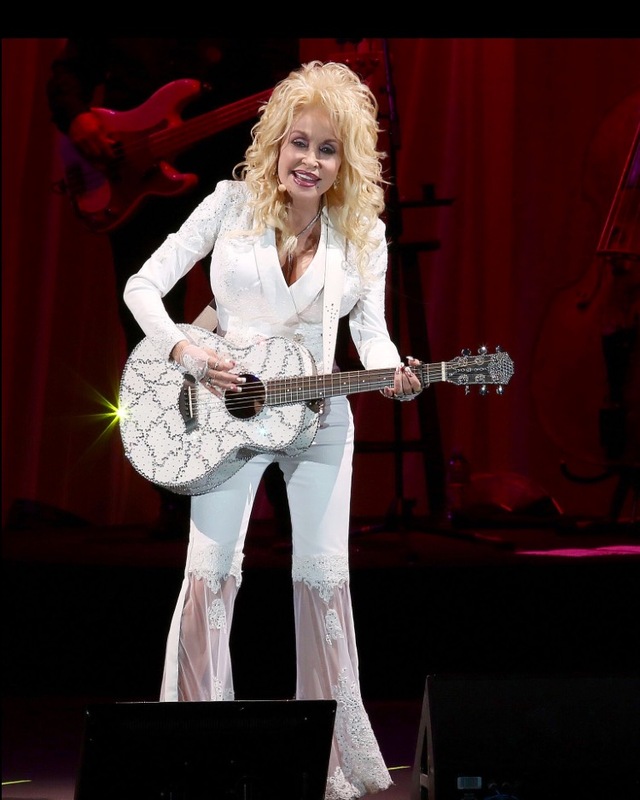 Parton is just about as beloved a figure as there is or could be in American music. You could look around and see faces turned toward her, reflecting pure love and joy at being there. I've never heard a bad word spoken about her, and I've never heard her speak a bad word about anyone else, come to think of it. Couple that with being married to her husband, Carl, for 50 years, and Parton is as rare as they come in show business. I just adore her - and so does everyone else. 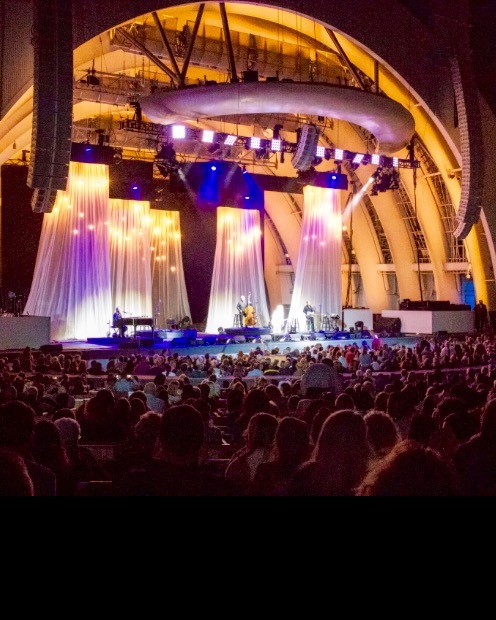 "Pure & Simple" is the name of this tour, and all the songs in the first half reflect exactly that ... Parton's pure, angelic voice, a very simple set of curtains and lights, and the story songs that share her love of a simple life and a delight at simply making music. Parton plays everything, and each of her instruments are extravagantly bedazzled with the rhinestones that she is known for. There are so many little sparkles reflecting off Parton, that she really doesn't show up too well on film, which is fine. She didn't have any of the big screens on, and all the shots on the screens further back were wide - all seemingly unnecessary, as Parton appears to be as gorgeous today at 70 as she's ever been. When Parton played her "Coat Of Many Colors" I had tears running down my face before I even knew what hit me. I looked next to me and Lacey was in the same shape. Then in front of me, where a young man pulled up the hood of his sweatshirt to hide the tears running down his face. The message of being proud of who you are and where and what you come from had hit us all hard, right in the hearts. It was special. Then Parton played one for her Dad, and she stood up ("He deserves a standing ovation!") and played "Apple Jack" on her glittering banjo, as well as I've ever heard the instrument played. We were all transported to those Smoky Mountains Parton sings of, and nobody ever wanted to leave. Then out came the sparkling sax for a little rendition of the Benny Hill theme, with Parton giggling and saying how "That was some good sax!" There was a medley of '60's tunes, with an a cappella showcase of such gems as "American Pie" and "Blowing In The Wind" with a bass singer who went so low people just had to laugh. Parton talked about how she's always been one to dress up and how she wants to go to Heaven, "But do I have to look like Hell to get there?" Even her kind of corny lines are adorable, and pretty much all of us wanted her to adopt us by the end of the night. There was a brief intermission (which was an intense cattle call of people dying to empty their tail-gating bladders and getting coffee to sober up before the end of the show - the trickle down from it being a "leased event") and Parton was back, done up all in red to sing a cover of Alicia Keys' "This Girl Is On Fire" - and she was. The energy was all the way up, and as Parton sang and danced and played everything from the dulcimer to the penny whistle, we were all enthralled. "I've always been too good to be real bad," Parton commented at one point, and I get that. Like we'll push it, but the love is always there. As Parton put it, "The only real thing about me is my heart." And that much is abundantly clear. She loves who she is and she loves what she does, and that's just about all you can ask for in this life. Amen. We got all the hits like "9 to 5" and "Islands In The Stream" and "Here You Come Again" and everyone was over the moon, singing along and not wanting it to end. It had to, of course, and "I Will Always Love You" just killed us all, right in the heart and soul. Not even the stellar Whitney Houston version can compare to hearing Dolly Parton sing her song so beautifully. Yes, there were more tears. Parton had one more, "Hello God", telling us that no matter how bad it seems like things have gotten here and around the world, we all still have more love in our hearts to give, and that's what it will take. Hearing her sing it, you believe. You know there's still good in the world, as long as Dolly Parton is there to sing about it. I hope everyone will take every chance they get to see and hear this marvelous woman at least once in their lives - it truly is something special to share the same air with someone as good as she is. 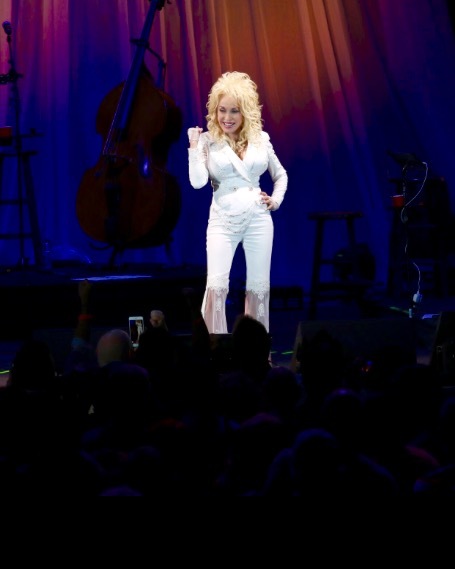 We love you, Dolly!